From the inbox today - Good news! It looks like there's a new breakfast and lunch place to choose from when you hop over the border into Indiana. Schererville, Ind. 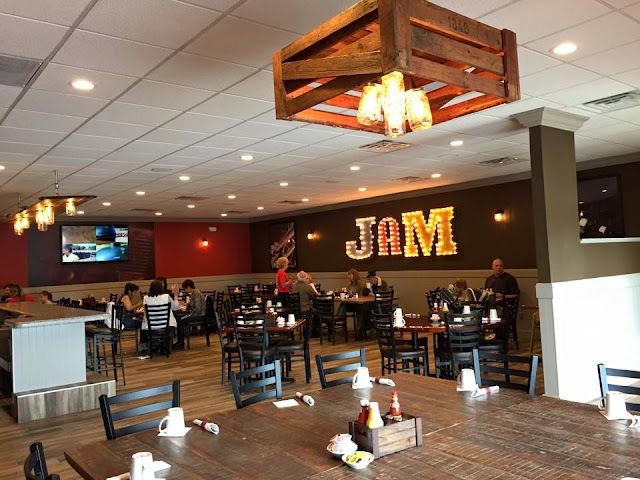 (May 20, 2015) - Toast & Jam Breakfast & Lunch Café in Schererville has opened its doors and is serving breakfast and lunch daily from 6 a.m. to 3 p.m. Toast & Jam will be hosting its grand opening the first week of June, which will feature many fun events and happenings. Breathing new life into the building that formerly housed Kelsey’s Steakhouse, Toast & Jam hired the interior design team of Mixdesign, Inc. to create fresh new custom décor features utilizing antique toasters, mason jar light fixtures to create a warm, welcoming atmosphere. The café offers guests homemade meals featuring breakfast and lunch classics, as well as specialty menu items such as Mediterranean strata and Cajun chicken mac and cheese. Owners Nick Karounos and Sam Cappas are excited to open this new venture in Schererville. “We have been very pleased with the support that we have received from the community. Schererville is a vibrant and growing town and we are proud to be a part of it. We look forward to serving our guests delicious food and making them feel at home,” said Cappas. Toast & Jam features two separate spaces for guests to enjoy. The “Toast” side of the café is the perfect place to savor breakfast or lunch. The “Jam” room is available for special events and parties, seating up to 80 people. Guests of the “Jam” room can enjoy a private bar, large presentation TV and king’s table, and choose delicious fare from a custom menu. Located at 7311 Mallard Lane in Schererville, Toast & Jam Breakfast & Lunch Café is open seven days a week from 6 a.m. to 3 p.m. For more information, visit www.toastandjamcafe.com or call 219-769-0000.